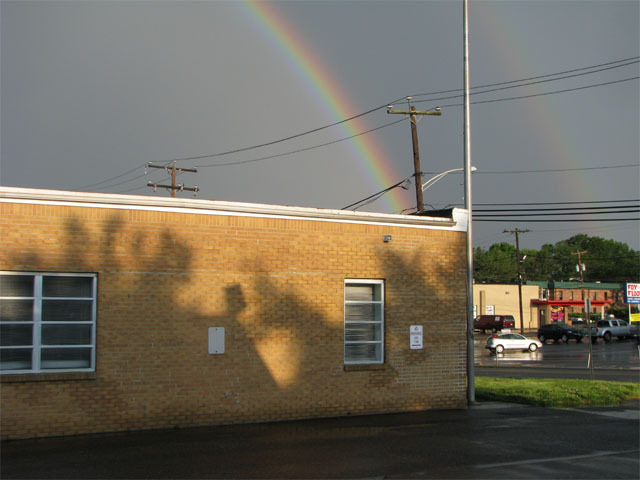 Last week I got to document nearly 100 post offices in and around the D.C. area. Among the finds were several old, new, and recently consolidated facilities. In what was undoubtedly a cost-saving measure, USPS just consolidated both operations into a new "Retail Center" in the corner of a strip mall just a few weeks ago. The location features more parking, but less accessibility to downtown Silver Spring. There goes your lunch break! One would hope that service would be improved by the new modern location, which features four clerk stations. When I had visited them in 2010, there was a long line at the MPO, served by two clerks, and modest lines at the finance station (served by one clerk). Logically, when two postal facilities get consolidated, 2 clerks + 1 clerk = 3 clerks, but that was not the case at the new, pleasantly designed post office, which featured four window stations and -- you guessed it -- two clerks. So, that's the story of Silver Spring. Now, let's check out the former former site of the Main Post Office, a stately 1936 WPA design. Just look at that lovely font! Bethesda lies just west of Silver Spring, and it too was served by two postal locations. As of the end of May 19th, the Main Post Office was moved and a nearby location discontinued as part of a consolidation into a newer retail facility -- one which, interestingly enough, is smaller than either other facility to begin with. The Bethesda Main Post Office had served since 1937. The WPA structure, replete with fantastic masonry, will now be sold. Let's have a look at a map and some photos of this now-former site. It was photographing this building when a woman I'd never met came up to me and correctly identified me, making me wonder whether I had some Inspectors on my case. "Yep, that's me. What gave it away?" In actuality it was a friend of my mother's, who knew of my work. That was loads of fun. Primarily a carrier facility, this location had a small retail section. A local site reports that the building will be torn down and the site re-developed into a 145-unit mixed-use apartment building. It was fun to see crews working on freshening up the front of the building. One concern of residents is that parking is highly limited nearby this location. Located about an hour's drive northwest of Washington, D.C., Waterford, Virginia is a tiny town with a lot of heritage. The entire town was designated a National Historic Landmark in 1970, and is listed on the National Register of Historic Places. Waterford is a mill town established in 1733, located alongside Catoctin Creek. The town's situation in a valley enabled one of the most phenomenal post office stories I've ever come across. Here's a general map. The town's got a lot of nice buildings. My friend John and I were photographing the post office just as Officer-in-Charge Rick was returning from lunch. He was incredibly gracious and suggested that, if we were fans of documenting post offices, we would likely enjoy the framed printout of a story they've got on the wall. 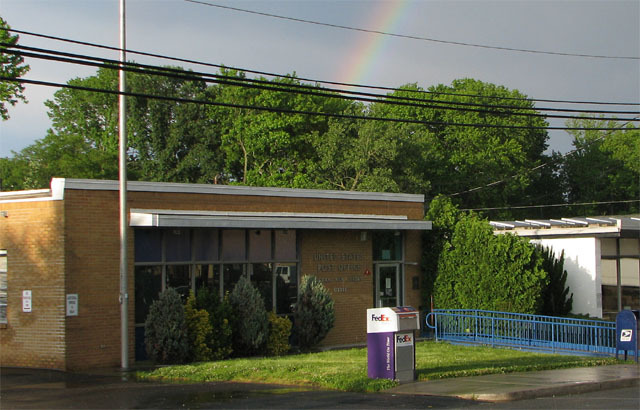 The USPS Leased Facilities report suggests that the post office has been at this site since 1955. According to Postmaster Finder, the first Postmaster, Daniel Stone, was appointed 1800. There is a large plaque on the wall listing all the Postmasters until 1997. 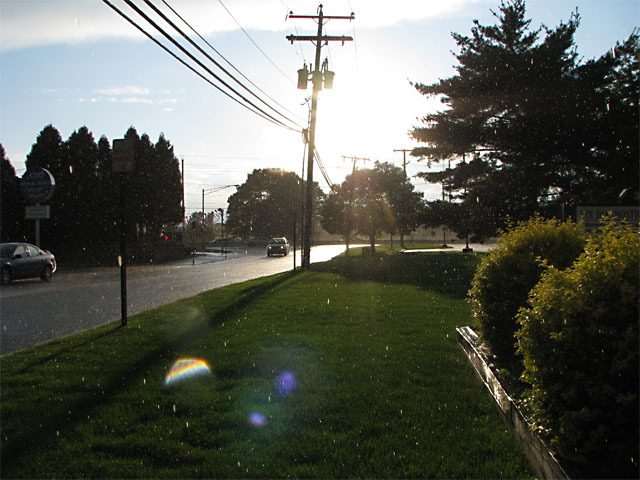 (You can also read a brief history of The Loudoun Telephone here (source of the header image below). The Library of Congress reports that the Library of Virginia appears to have a microfilm copy of this paper available. The report which was briefly mentioned in a portion of our issue last week, relative to a serious flood and washout in Waterford Thursday evening of last week, was not exaggerated. The rain poured down in torrents upon the hilly town and soon the main street, which was on low ground, was a roaring river, the water raising up to the doorsill of the insurance office. The tin and stove store of Mr. H.C. Bennett, in which the post office is kept, was built upon posts and was in the track of the torrent, which quickly undermined the building causing the lower floor to fall into the flood, carrying with it the contents of the post office, including the postmistress, Miss Clara Divine. Three men who chanced to be near by rushed in, at the risk of their lives, (for the upper floor, loaded with stoves &c., was liable to fall at any moment) and, with considerable difficulty, succeeded in rescuing Miss Divine. The iron safe and a box containing $80 went down into the flood but were subsequently recovered, but many other things were lost. The post office boxes were tipped backward and all their contents were emptied into the stream. The Mermaids of the Chesapeake bay are probably now enjoying the perusal of the letters that went down with the flood. They don't write stories like they used to. 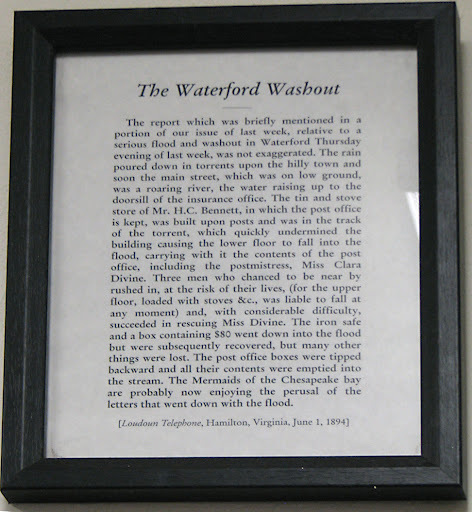 One question is the precise position of Miss Divine, since Postmaster Finder reports that Mr. Bennett was the official Postmaster of Waterford at the time of the flood. Yesterday I was heading back from Philadelphia to New York City since I finished graduate school last month. (Did I mention I graduated? Good stuff.) Spent a pleasant afternoon along the Jersey coast, featuring a massive and delicious burrito from 10th Ave. Burrito in Belmar. Part of the great thing about late spring and summer is that you can photograph towns and post offices well into the evening. Last night I was busy until 8:15. At 6:30 a thunderstorm bore down on this corner of the Jersey shore, though it produced more noise than rain. It was actually still raining at the time, too.